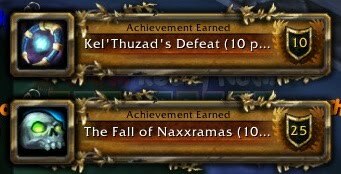 We hit up Naxx a few times the past two months to try to burn out a lot of those achievements. And we did. 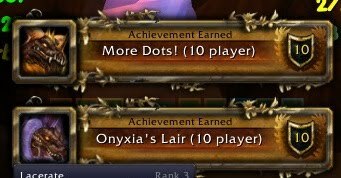 We’ve gotten guildies any and all of the following (on 10 man of course): Momma Said Knock You Out, Arachnophobia, Spore Loser, Make Quick Werk of Him, Just Can’t Get Enough, and all of the achievements for the various quarters. We’ve even downed Sapph (with a Pally aura, though next time, we’re getting The Hundred Club). And, well, a picture is worth a thousand words. I wish that more than two achievements at a time showed up. People got three or four on that run–Champion of the Frozen Wastes and Just Can’t Get Enough and the like. The past month we’ve been trying to hit up Onyxia weekly. To work on raid awareness and cooperation and recognizing voices on Ventrilo, etc. Also to gear up offsets and try to get that damned dragon to drop her offspring for us to ride around on (which has yet to happen)! We’ve gotten some awesome achievements in there, too. Ignore the Lacerate mouseover. >.> Oops. We’ve even hit up OS once or twice for the Weekly. We always seem to get Dragons or Demons for our Weekly. 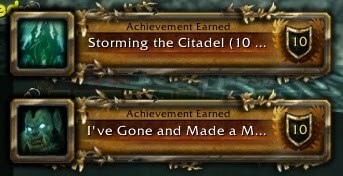 Hm… So we’ve gotten a lot of guildies the following achievements. Yep. First ever guild run we got these. It’s a huge achievement for us, considering we’re a “casual” raiding guild that maybe spends one or two nights in ICC10 on the weekend, and runs various achievement nights during the week. 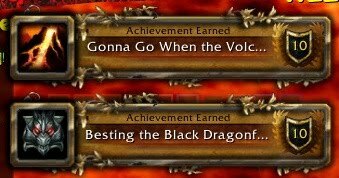 All of these achievements make me wonder what our guild is going to be like come Cataclysm. Quite a few of us are interested in achievements. I wonder if we’ll be trying to get the Guild levels and Achievements AQAP (as quick as possible). Here’s to Shade of the Elm! Huzzah! !